On Saturday, I had the honor and privilege to perform a show at the Camden Ferry Library in Camden, NJ. These kids deserve everything. I don’t want to paint a negative picture of Camden because I want to focus on the positives. I drove by the school and it looked magnificent. Grand. It was like looking at the Sydney Opera House compared to everything else. Absolutely beautiful. So inviting. And the public library was fantastic. What a safe space. Kids in places like Camden deserve everything. I’ve reasoned that I need to find a role so that I can help kids who don’t have anything get the same things that I had access to when I was a kid. Or help kids get access to new technology and ideas that will help make them successful. I think that is a great role to have in life. Like a principal, a teacher, a doctor without borders. As I get older, my goals and markers for success need to be less about me and more about other people’s needs. My success needs to be based on combined success. What’s the point of being successful if you can’t share it with other people? 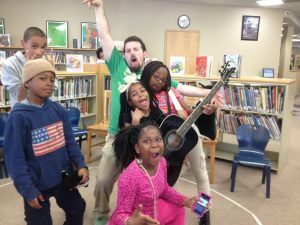 I played an hour show and I let the kids try out all of my instruments. I had to change everything completely because I needed to work extra hard to keep the kids focused. It was a challenging show but I felt like I really connected with the kids in the audience. At the end, I let the each child take home an egg shaker — I’ll have to dig into my own pocket to replace them but it was totally worth it. These kids deserve everything. A little boy named Jihsaad also came up to me after the show with one of my business cards and asked me how I made it. I said I hired a graphic designer to draw it for me. He asked, “Could you draw me my own business card?” I lit up. I asked him to write his name on the top of the card. I asked him what his business was called and he said, “Musical Art Genius.” Then I asked him for his website and he said, “www.artist.com”. Then he asked me to draw a picture of him playing the guitar. I asked him if he wanted me to draw the cap that he was wearing and he said, “No. Can I be wearing a beret?” I couldn’t believe it. I also have a guitar that folds in half and goes into a backpack. Jihsaad was asking me how it worked and I got this amazing one-on-one moment to show him all the gears in the neck and how I loosened the strings to fold it. He was fascinated. He wanted to make a guitar just like that. 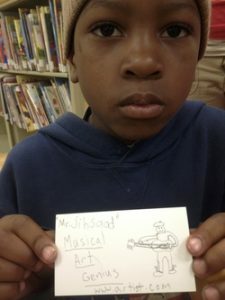 Jihsaad is a “musical art genius” in the making. I was like, “Maybe in high school or college you can learn how to make one?” And he was so into the idea. I loved it. After the show, I spoke with Lisa Whitley. She was so fantastic. I saw her read “The Very Hungry Caterpillar” with a young girl named Amaya. I watched as Ms. Whitley helped Amaya sound out all the words in the book and read through it. I believe that every book you read your life gets that much better. Lisa said to me after the music show that there is so much to learn about working with this population. She said that she is always learning. All the kids and the people at the library really seemed to personally connect with her and that was so cool. 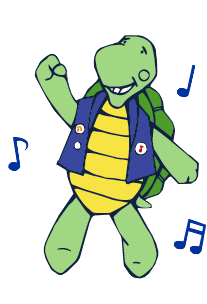 I also got to talk to the security guard at the library and he said that the program was great and that kids needed more programs like it. He said that these kids need more people who can support them and give them the confidence to do something great when they get older. I hope I can keep learning and I hope I can do just that.